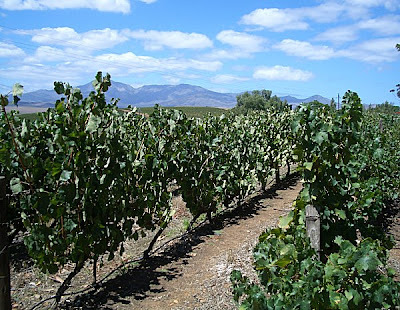 Today I am flying to the Cape where I intend to drink a lot of Pinotage, eat good food, visit wineries, enjoy the scenery, and generally have a great time. And lots of wine ! 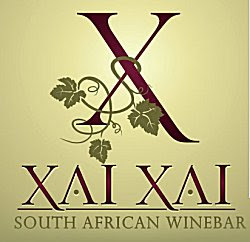 Pinotage at Xai Xai, New York City's only South African Winebar, has been so popular that they sold all their stocks less than two months after opening. 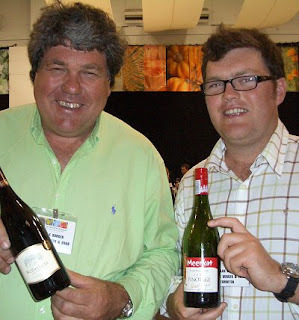 "The waiter told us that demand was so high for Pinotage that [Fairview Primo 2002] was the only one left at $78. They discounted it to $50, " reports Knight. "It was really good. Soft, with hints of berry - the age really mellowed out what I expected - with supporting tannins and a plush finish. It was wonderfully balanced, even getting better as it sat in the glass. Reminiscent of a fabulous Oregon Pinot Noir without the big bite." Libby's Pride is a new label from Elizabeth Peterson (pictured right). 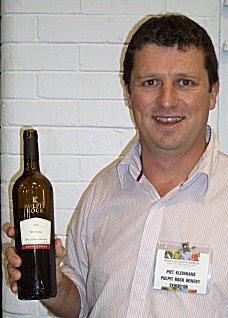 Her maiden vintage, the 2006 Robertson Pinotage, is made by Wickus Erasmus of Le Grande Chasseur Estate. The wine underwent malolactic fermentation, and a years maturation, in French oak barrels. I found it very very soft and jammy. Attractive to the new wine drinker market that it is aimed at, but I would prefer a little more structure; it's rather flabby and one dimensional and I didn't pick up any oak effect. What happened to Sentinel? 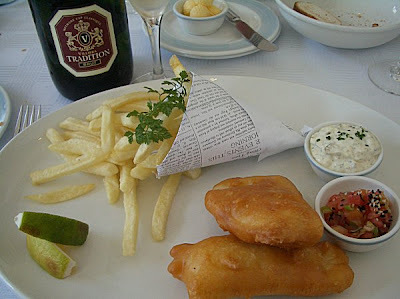 The winery was owned by Cape wine figures Walter Finlayson and Rob Coppoolse. That they made good wine is not in doubt. 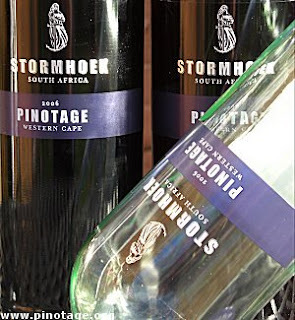 This 2003 Pinotage is garlanded in awards – in 2004 the Pinotage Top 10, Trophy at Capital Fairburn and a Veritas Silver. I did not meet a local that liked Sentinel's ‘castle’ perched on a ridge overlooking the R44 just north of Stellenbosch. However my spirits are always lifted by its incongruous vision, stonework lit golden by the sun, towering over vineyards. Around the base were historic muzzle loading cannons rescued from wrecks of wooden warships on the seabed that had foundered along the coast. Now the property and vineyards have been acquired by neighbouring L’Avenir who will remodel the castle and use it for their tasting room. Which is another shame as I enjoyed tasting wine in L’Avenir’s winery barrel cellar next to a lake, although the tasting room staff no doubt found the cellar depressingly cold and dark. This 2003 Sentinel Pinotage is intensely dark and opaque. It is mouth filling, dense and ripe with a balance and depth, offering fruit of the forest spiciness with tobacco leaf. It is soft, tangy, and a bit chewy with a whiff of leather on the dry finish. An excellent example of the art of Pinotage. Farewell, Sentinel. I’ll miss you. Warwick Estate were the official wine supplier for the 13th International Investment Council dinner held in George last month. 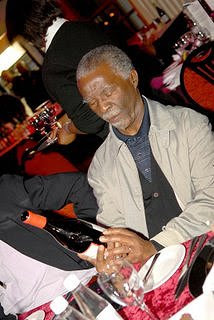 Warwick’s ‘Old Bush Vines’ Pinotage was the preferred choice Thabo Mbeki, President of South Africa, and he took the opportunity to carefully study the back label, pictured right. Picture of President Thabo Mbeki taken from Warwicks blog at www.warwickwine.blogspot.com is Copyright © Warwick Estate and is used with kind permission. 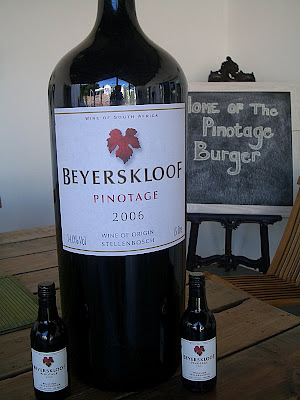 Stormhoek, famous for their unconventional marketing via blogging (not to mention an easy drinking, modern style Pinotage) have collapsed "into administration" reports UK's Off Licence News after cash-flow problems. The administrator is said to be looking for a buyer for the company as a going concern but all ten off the staff, including founder Nick Dymoke-Marr, failed to get Christmas pay cheques and were handed redundancy notices this week. A truly sad setback for such an innovative business. 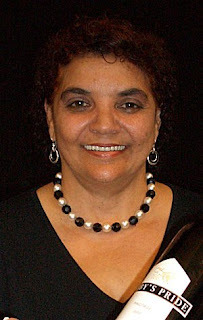 I wish all the staff the best for 2008. 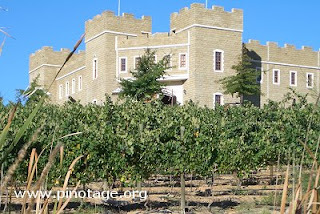 I blogged about Meerkat Pinotage some time ago. So I was really pleased to, at long last, taste it and meet the owner and winemaker, father and son team, Schalk and Tiaan Burger of Welbedacht Wines. TV wildlife programmes made Meerkats such a hit with the viewing public after showed them standing upright on their hind legs looking into the distance like opera goers at Gyndeborne that I wondered how Schalk managed to copyright the meerkat name for his wines. “I registered the name years ago, just in case, because I thought I would make a good label,” he explained. 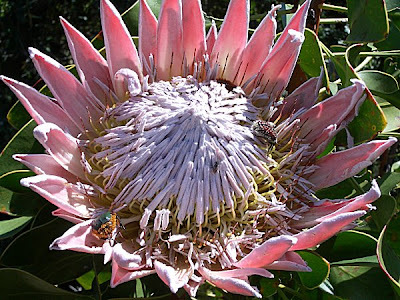 Meerkat is used as a second label, but although not registered as an Estate Wine, the wine is all grown and made on Welbedacht. 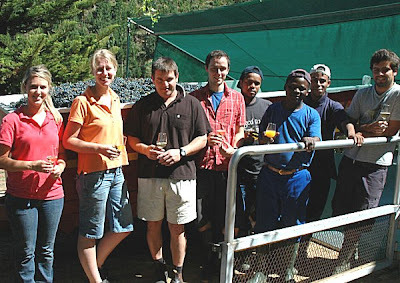 It is easy to see why Meerkat Pinotage has found so many friends. The 2006 is instantly approachable, being very fruity, doesn’t taste overly dry (it has 2g/L RS), and there’s some soft wood tannins (50% had stave treatment). A quaffable and gregarious wine. 2002 might have been a difficult vintage in the Cape but this wine is a triumph. Deeply flavoured, savoury with tobacco leaf and dried herbs. It develops in the glass, providing a (restrained) roller coaster of flavours. There’s cherry and blackberries on top, with some muscular tannins lurking underneath. There’s a depth and structure to this wine and as we finish the last glass its opening up offering an intriguing dark chocolate bouquet. If I’d had another bottle I’d have been tempted to pull the cork there and then. But better still to keep it a couple more years. I so enjoyed the Spier that the following evening I opened one of my all time favourites, La Cave 2003. But I was disappointed that choirs of angels didn’t sing this time. Maybe this was an off bottle, maybe the wine is entering a dumb phase, but the fruit was subdued and acids were to the fore. Drinkable but not, this time unfortunately, a wow. 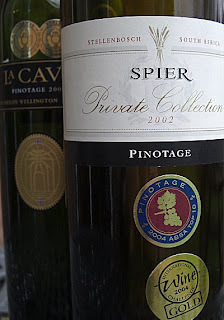 Comparing the labels, while La Cave shows the winery name, location and website & email addresses, the Spier wine gives no such information, just the name Spier.